So go on, give it a bash. And for the technical-accuracy-challenged of you out there (looking at you, Brad ;-), remember the language you probably use (if you're reading this), is CFML, not ColdFusion. ColdFusion is the app server (or, hopefully, Railo is the app server ;-); CFML is the language. Anyway - ColdFusion, CFML, Cold Fusion or DBML - go have a Tweet. Support your language! I've been mulling this over since I released the CFScript docs on Github. I made a point of saying it was not aimed at teaching CFScript, it was just a reference. I then started thinking about writing a document which was a tutorial, not a reference, covering CFML. We need a decent guide to using CFML (I do not consider any of the current options to be "decent"). Thinking about it, it became clear it was going to be a non-trivial undertaking, and given my career was vacillating all over the place at the time, I pushed it into the back of my mind. CFML: Assignments in conditional statements. Yes or no? I have to bang this out in 18min, as the pub is calling (it's Xmas Eve Afternoon). 17min. Crikey. Note the typo: "=" rather than "==". I have heard about Jasmine, and like the look of it, but have never actually downloaded / installed / ran it. I'm gonna do that today. I am writing about this as I do it. If you're familiar with TestBox (and if you're a CFML dev, you bloody should be! ), then this will look comfortingly familiar. Indeed that code would run on TestBox. I know a bit about TestBox, so this is pleasing: I have a head start! I'm gonna use 2.1.3, which is - at time of writing - the latest version of Jasmine. The download page is here: jasmine 2.1.3. I've D/Led that and unzipped it into a public directory. I sat down on Saturday / Sunday and taught myself enough Go to be able to answer the puzzle question from "Something for the weekend? A wee code puzzle (in CFML, PHP, anything really...)". I've certainly got a lot of mileage out of that one topic, eh? Oh well: I think it's a good baseline exercise for researchng new languages, and I like seeing other people's code, too. I'm so pleased I got such a good range of submissions. However it does mean it's taking me an age to slog through them all. Right, so I discussed Adam Presley's two Go entries over the last few days: "Weekend puzzle: Adam Presley's answer (Go)" and "Weekend puzzle: Adam Presley's answer - redux (Go)", and I did a "G'day World in Go" exercise in prep for understanding his code. Not that a "G'day world" exercise was sufficient for that, but at least I got Go installed and compiling, and located the docs etc. Adam Presley is a bit of a star. I had a look at his original entry to the code puzzle and decided I didn't like it as it was too long-winded ("Weekend code puzzle: Adam Presley's answer (Go)"). He's subsequently come back to me with a simplified version, listed on his own blog: Response To Adam Cameron's Code Review. He took my comments in good grace, which is very good of him. Adam's been busy recently. You'll've heard about his new book "REST Web APIs: The BookREST Assured: A Pragmatic Approach to API Design" which is being released soon - I'll have a review up and a competition to win a copy next week - but he's also released the first book dedicated to ColdFusion 11's newest marquee feature: CFClient. I know I have derided CFClient a lot, but it does have its good bits, and Adam has worked through them all and put a fairly accessible book together. Granted it's not very long, but for something that focuses on a single tag, I think that's fair enough. It's free and open source, so you should go get it, and give it a read. It might make you think again about whether or not to use CFClient. I have to admit it did give me pause for thought. Go grab it from it's official website now (it's just a PDF): "CFClient The Good Parts". It's exactly this attention to detail Adam Tuttle captures in this latest book. I have been looking everywhere for an in-depth look at the useful features of the cfclient tag and I have to thank Mr Tuttle for providing it! I am not good at reviews but I should say that this is not only The Good Parts, it is also the definitive guide. 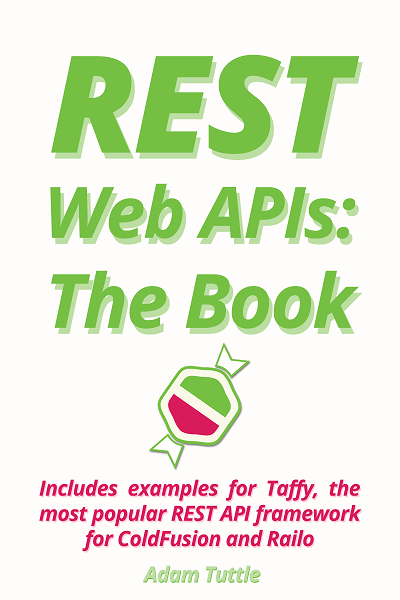 I'll get back to you about the REST book next week (here it is: "Book review: REST Web APIs: The Book (win a copy here)"). The CFClient book'll keep you going until then. This is the first in a series of brief articles I'm going to write to demonstrate how Adobe (and, for that matter, Railo) could have implemented functionality that was formerly the preserve of tags in CFScript. The first (mostly random) example is <cfldap>. I have picked <cfldap> because someone mentioned it on IRC the other day. And I hated the advice I had to give them by way of implementing their needs in CFScript. The problem CFML developers are faced with is that both Adobe and Railo are eroding the quality of the CFML language by implemented cross-cutting "generic" solutions for shortfalls in CFScript functionality, rather than addressing each piece of functionality professionally and thoughtfully. At long last, I'm continuing to look at each person's submissions for the code puzzle ("Something for the weekend? A wee code puzzle (in CFML, PHP, anything really...)"). There's been a bit of a hiatus because I've been busy with other things, plus generally not that interested in keeping up with this blog. Oops. OK, so Adam's effort is in Go. The github repo for it can be found here: https://github.com/adampresley/adamCameronCodeChallenge201411. I've got an odd situation at present... I have a suspected lump on the inside of my eyeball, underneath my retina. I say "suspected" because the symptoms I have are those that I've had before with my other eye, and "a lump" was what it turned out to be. The manifestation of this lump is that I have a "dull" patch in my vision, caused by the light hitting the wrong part of my retina where the lump is, and my brain not quite being able to adjust for it. I'm in the NHS waiting list to get it seen to, but that's not until Dec 31. Last time the treatment was some pills, so I hope it's the same again, rather than it being like something from Un Chien Andalou. Anyway... I'm telling you this because currently I am off work due to only being able to look at a screen for a few minutes at a time, before my head starts hurting. The dull patch is to the immediate right of my focus when reading, meaning the word following the one I am currently reading is "greyed-out". Frustrating as f***. I'm finding this jolly tedious, have decided to try to write something today, to check how long it is before I need to give up. Hopefully it'll also give my brain some training to work around the dull patch. In my vision, I mean. So - other than the fact I'm already at the 250-word mark with completely off-topic nonsense (what is this? CFHour? ;-) - here's a short article on my experiences of getting Go up and running on this box. it's very straight forward, and this article really only serves to demonstrate how straight fwd it is, so as to perhaps give people encouragement to try it out. Firstly, sorry this blog has been a bit of a non-event recently. There's various reasons for this - none of them interesting - but I'll get back on form soon. -ish. In George (Railo 4.2 successor) the release date is set by the build process in the default.properties file, the location for this information has moved because this file is common practice with OSGi. odd to describe it as "Railo 4.2 successor" when previously they've been very open about referring to it as "Railo 5". Dunno what to make of that. I might just be reading too much into casual words on a Google group. Anyway, it's jolly good to hear mention of it. I just bloody wish they'd hurry up and release the damned thing. At least to a public beta or something! It sounds like it's really going to be a great step forward for CFML, and will probably give Adobe a bit of a fright, I reckon. PS: thanks to John Whish for helping me get this article up onto coldfusionbloggers.org, which I cannot access from this machine @ present, for some reason. Firstly, hey thanks to everyone who filled the survey in! I got over 100 responses within the space of a coupla days. That's the fastest I've had responses to a survey. Cheers! Anyway, what did you have to say? And Anit doesn't. No matter what gets thrown at him. He works to help his (ColdFusion) community. No excuses, no "closed/cantbearsed". Anit just cracks on and gives us the answers. Almost everyone else on his team could draw a page from Anit's book when it comes to client support. I have no idea why I'm doing this, but here you go Andy: a blog article. The subject kinda says it all. I'm just curious as to how people tend to code their function signatures, so I'm running a short survey. The survey is closed: Survey Monkey will only allow me to gather 100 responses, which I've now got. I hope Salted (/Ross) and Ryan don't mind me pinching our IRC conversation for a blog article, but... well... too bad if they do. It's done now. This is it. Ross was asking "whats the most efficient way to remove the first two items in a list and get back the remainder", which made my eyes narrow and decide there's probably something to get to the bottom of here. Because he mentioned "lists". And these should - in general - be avoided in CFML. Now... I think lists are overused in CFML, and - indeed - they are a bit rubbish. Having a string of data and then using one character (OK, or "some characters ~") from the string as a delimiter is seldom going to work, especially with the default delimiter of comma. Because in really a lot of situations, commas are actually part of the data. And same with any other char-based delimiter (except say characters specifically intended to be delimiters like characters 28-31 (file, group record and unit separators, respectively). I really don't think lists should generally be part of a solution to anything. 16:36 <adam_cameron> Salted: first question that should be asked... why is it a list in the first place? Do you have any control over it? 16:37 <adam_cameron> so it's a string? Not a list per se? 16:37 <adam_cameron> So what you actually want is everything after the second space? My point here - one that Ross doesn't entirely agree with - is that just because one can use a string as a list, doesn't mean - semantically - it is a list. And one should try to keep one's code as semantically clear as possible. But what it isn't is a space- (or comma-, or anything-) separated list. So one should not solve this problem using lists. One should look at the actual requirement, and solve that.